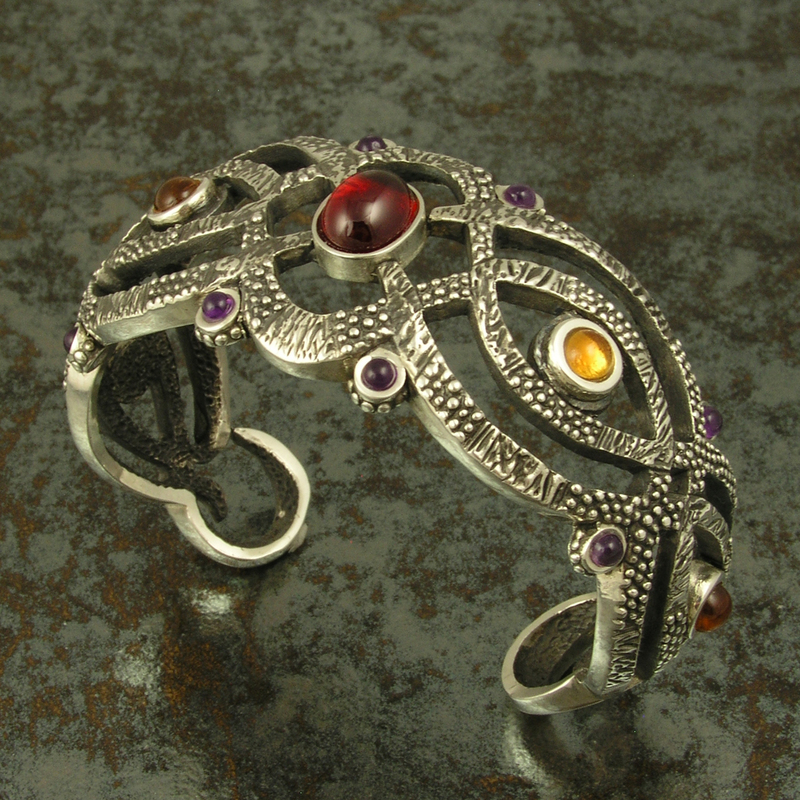 This week’s jewelry item is a sterling silver cuff bracelet featuring amethyst, garnet and citrine cabochon cut gemstones. As you will notice this bracelet does not have any of our usual inlay work, just the 3 different cabochon gemstones. The center stone is an oval 3.8ct. Mozambique garnet cabochon flanked by 4 round glowing yellow citrine cabochons totaling 2.8cts. The outside edges are adorned by 8 purple amethyst cabochons totaling 1.68cts. The silver has been oxidized to provide more contrast between the highly polished areas and the darkened recesses in the design detail. The oxidized silver also gives the bracelet a nice soft antique look. Many other colored stone choices could be set in this bracelet. Special orders are welcome! Here is a little information about the gemstones in this bracelet. Mozambique garnets are known for their high quality and warm, red colors. Mozambique garnet is a mixture of pyrope and almandine garnet, similar in color to rhodolite garnet, but slightly more red, and darker. Garnets are often worn to relieve inflammations of the skin and its powers include healing, strength, and protection. It is also believed to regulate the heart and blood flow and aid in curing depression. Citrine is a variety of quartz ranging in color from yellow, yellow-brown, orange, dark orange-brown and reddish-brown. Citrine is often found in association with amethyst, but it is much rarer than its purple cousin. Citrine is warming, energizing and imparts a flexibility and openness to new experiences. It has the power to impart joy to all who behold it and instills a positive attitude. Gloom and negativity do not exist around the citrine. Citrine supports generosity, helps you hold onto your wealth and draws all the good things in life to you. Amethyst boasts the color of royalty, a rich violet-purple and is the most highly prized variety of quartz. Amethyst is cleansing, both physically and psychologically. It helps promote internal balance, harmony and stability. Amethyst also helps sharpen the conscious mind and enhances one’s mental powers. It is used to improve memory and keeps thoughts in line with life goals. Amethyst is the stone of pure, true, emotional love. Special care should be taken when cleaning the stones in this bracelet. Do not put the bracelet in an ultrasonic cleaner or use a steamer to clean it. Simply brush the stones with an old toothbrush and a mild soap to remove any dirt or lotions. Avoid harsh chemicals as well as prolonged exposure to water. It is very important for citrine and amethyst not to be left in the sun, or to be in situations, where they will be exposed to prolonged sunlight or heat. Because of sensitivity to heat, the stone?s color could change and fade into a lighter color. Store the bracelet in a box or soft pouch when not wearing it to avoid being scratched by other items. 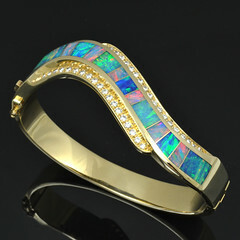 We are currently offering this spectacular bracelet at 10% off the regular price of $750. The special price of $675 is good through Monday September 5, 2011. Go to our website to view more photos or for purchasing information at http://www.shop.hilemansilverjewelry.com/Silver-bracelet-with-amethyst-garnet-and-citrine-cabochons-swirlcuffSSGarnCitAmeth.htm. You don’t need a coupon code, the price will be adjusted in the shopping cart. Feel free to contact us with any questions or customization requests. 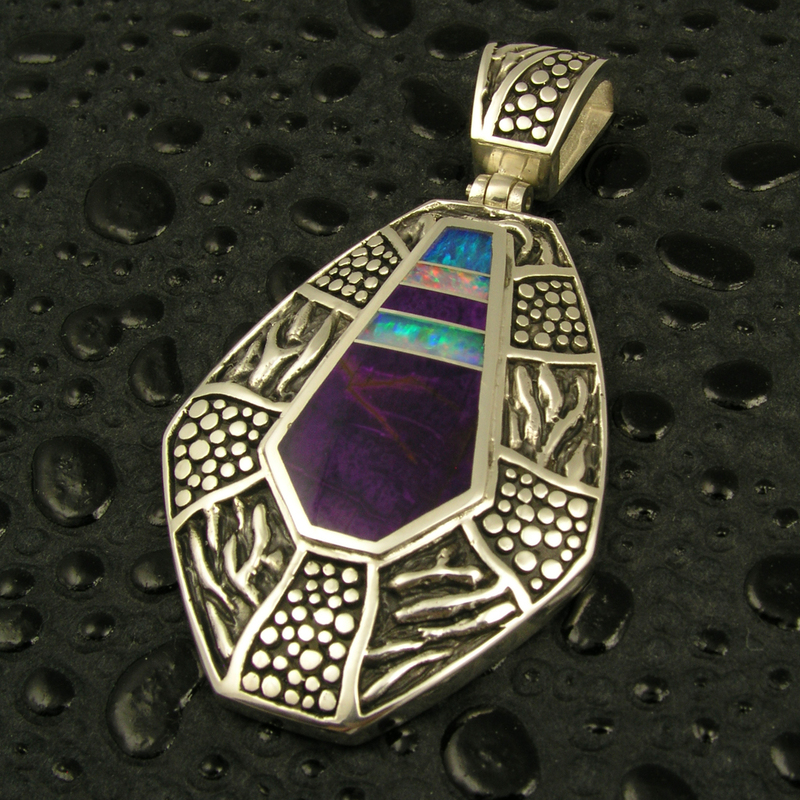 This week’s item is a large sterling silver pendant inlaid with Australian opal and purple sugilite. The top piece of inlaid Australian opal fires blues and greens and the other pieces of opal fire red, green, blue orange and yellow. The sugilite is a deep purple and is very high quality with an excellent polish. The lower areas of the silver have been oxidized black to accentuate the highly polished details. The pendant measures 34mm wide and is 63mm long including the hinged bale. The bale will accomodate most chains and smaller diameter beads. The pendant is stamped sterling and hand signed “MMH” on the reverse by Mark McBride Hileman. This style pendant is also available by special order in other inlay colors and without the silver oxidized. This beautiful piece is currently available at our Etsy shop. Please go to http://www.etsy.com/listing/28587677/large-sterling-silver-pendant-inlaid for more information or to purchase this piece. Don’t forget to enter the coupon code to get your 10% off discount at check out. Visit our websites to see all of our handmade jewelry designs in 14k gold and sterling silver. 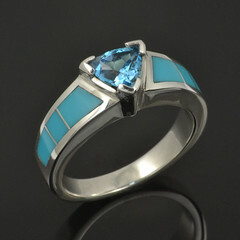 Keep in mind that if you don’t see exactly what you are looking for, we do custom jewelry work as well. This week’s item is one of our show stopper pendants. 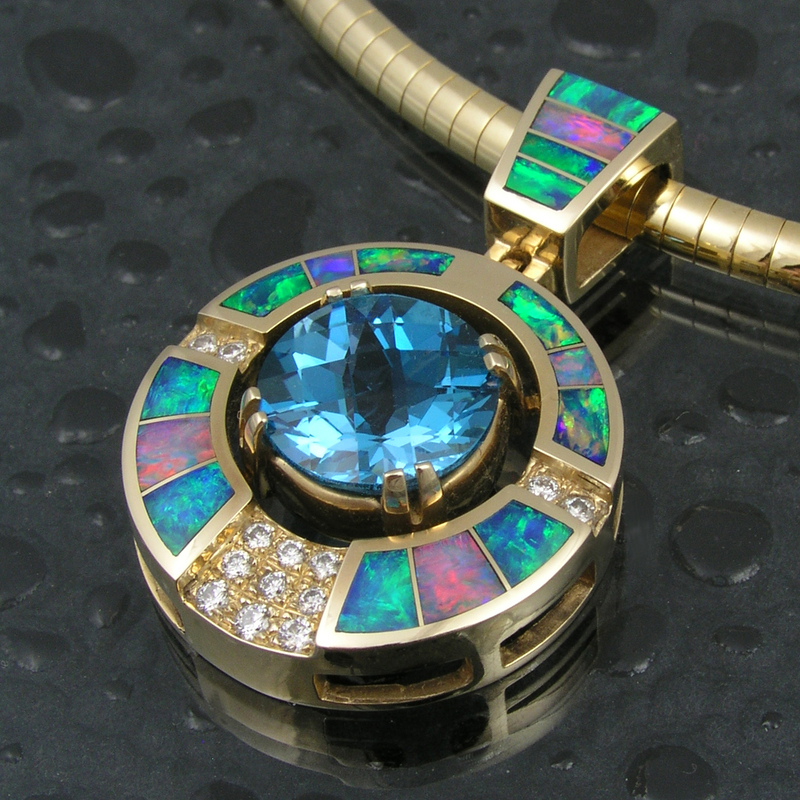 This stunning handmade 14 karat gold pendant features a bright blue topaz with Australian opal inlay and diamond accents. A huge 7.3 carat blue topaz appears to be floating in the center of this eye catching opal inlay pendant. The blue topaz harmonizes nicely with the 16 pieces of inlaid Australian opal. Each inlay section of the body of the pendant contains two pieces of inlaid blue green opal with one red piece of opal inlay in the middle. The hinged bale is also inlaid with four pieces of outstanding blue green and red firing Australian opal. The remarkable Australian opal inlay will mesmerize you as it flashes different colors of blues, greens, and reds. The .30 carats of G color VS clarity brilliant round diamonds provide additional sparkle to this statement piece. This unique opal inlay pendant is stamped 14k gold on the back and is hand signed “MMH” by Mark McBride Hileman for authenticity and added collector value. For more information about this pendant please visit our Etsy shop at http://www.etsy.com/listing/48127165/australian-opal-inlay-pendant-with-blue?ref=pr_shop . We have started a new weekly feature in our blog where we spotlight one of our jewelry designs and place it on sale for one week. 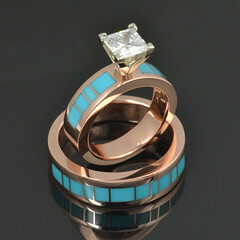 This week we are focusing on one of our most popular rings designs. This 14k gold ring showcases all of the attributes Hileman jewelry is known for- bold design, incredible opal, flawless inlay work and precision diamond setting. The center stone is a beautiful 2.5 carat cushion cut Amethyst with a checkerboard pattern on top. 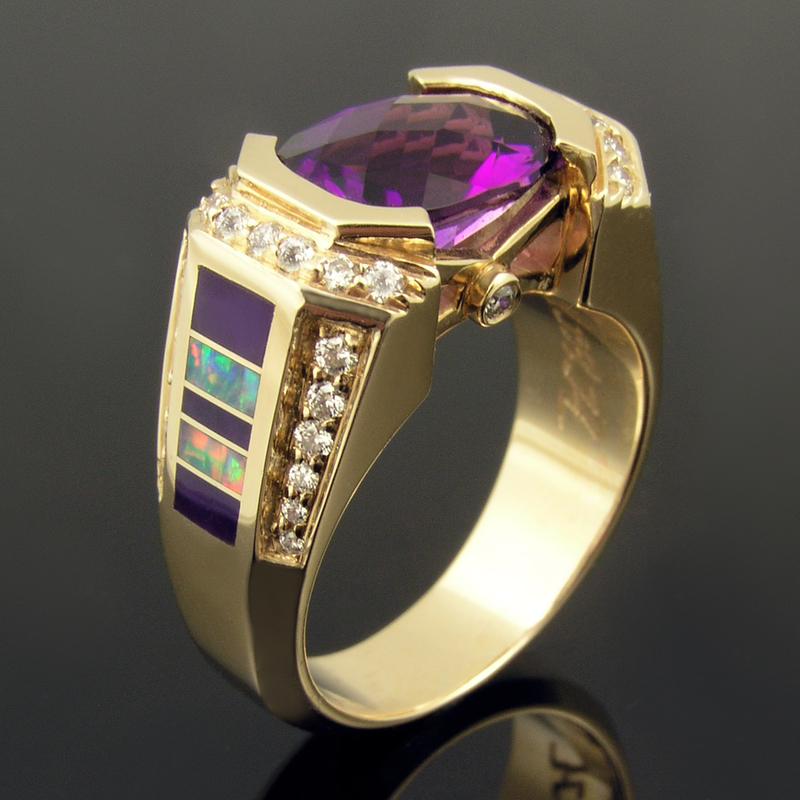 Both sides of the ring are inlaid with Australian opal and gem grade sugilite. The incredible Australian opal inlay fires a rainbow of colors and looks great with the sugilite and Amethyst. The 40 pave` set diamonds add just the right amount of sparkle and flash to bring all the design elements together in one stunning package. If you like to stand out in a crowd, then this ring is what you have been looking for. Whether you choose to wear this opal ring design as a wedding ring, engagement ring or cocktail ring it is sure to be an attention getter. For more information about this opal and amethyst ring or to purchase it online visit our Etsy shop at http://www.etsy.com/listing/45681360/australian-opal-inlay-ring-with-sugilite . And most importantly, if you choose to purchase the ring don’t forget to enter the coupon code below to get 10% off this incredible ring!